Depression-era Toronto is the setting for Gregg Taylor’s pulp hero The Red Panda and his sidekick The Flying Squirrel. The novel opens with the last of the big gangs in the city being brought to Justice; Police Chief O’Mally railing against the masked vigilantes at loose in his city. While the Press love the hero: defender of the weak, the poor and the downtrodden of society. Out from the ashes of the many gangs that our hero’s have crushed rises a new gang, The Crime Cabal. This new gang knows that for them to flourish, they must deal with The Red Panda once and for all. But there is more behind the Cabal than a simple gang. When the hulking enforcers of the gang turn out to be zombies it’s clear that this is no ordinary gang. 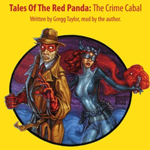 The Tales of the Red Panda: The Crime Cabal is the first novel set within the same setting as the podcast audio dramas, also written and produced by Gregg Taylor under the Decoder Ring Theatre banner. 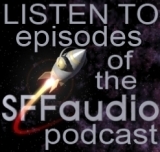 There is continuity between the podcast and the novel, but the novel does stand on it’s own, even providing an origin story for one of the long running supporting characters. The setting and characters are all introduced with enough background and flare to be fully formed within the novel alone. Gregg Taylor does a commendable job with the narration and the characters. Of note are the character voices especially as I’ve listened to the audio dramas for some years. Taylor captures the essence of the voices of the characters as they have been portrayed by other actors. For several years in some cases. So, even if you have listened to the podcasts you won’t be disappointed by the the portrayal of familiar characters, and if you haven’t then they come out fully formed characterizations. My only niggle is that in the first few chapters the narration feels just a little rushed in places, but this passes.